You know how you sometimes follow a blog for so long already you can't remember how you ever found it or what manicure triggered you to start following the blog? That's what I have with Life and Polish, hosted by the lovely twin sisters Elizabeth and Katy. I always enjoy their manicures so much and I am very delighted Elizabeth wanted do create a guestpost for me! It even includes gorgeous jewelry ♥. Hi loves! I am so excited to be guest-posting over here at Love, Varnish, Chocolate & More. I love Deborah & Manon's manicures so much & I hope you'll all like what I have for you today :) If you don't know me, I'm Elizabeth & I run Life & Polish, a little Canadian blog, and like Deborah, I have a weekly guest poster, my twin sister Katy posts once a week on Sundays! If you follow me on twitter or instagram, you'll know that recently I decided to re-read The Hunger Games series. I LOVE those books, and I get sucked in so fast, even though I have re-read them several times already. 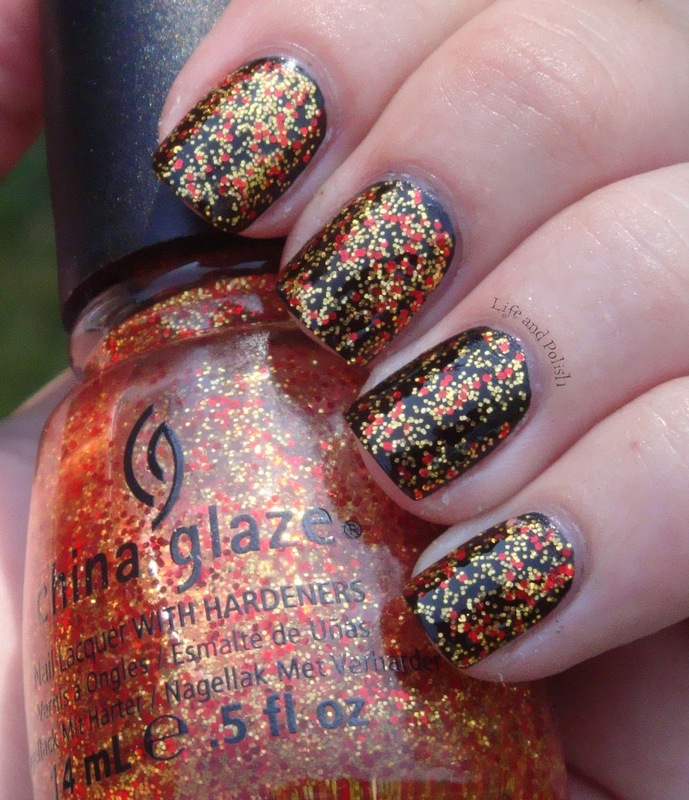 Anyways, when China Glaze came out with their Hunger Games themed polishes, I initially only bought 3 polishes, but on a recent online shopping trip, I threw Electrify in my shopping cart, but it wasn't until recently that I decided to wear it! 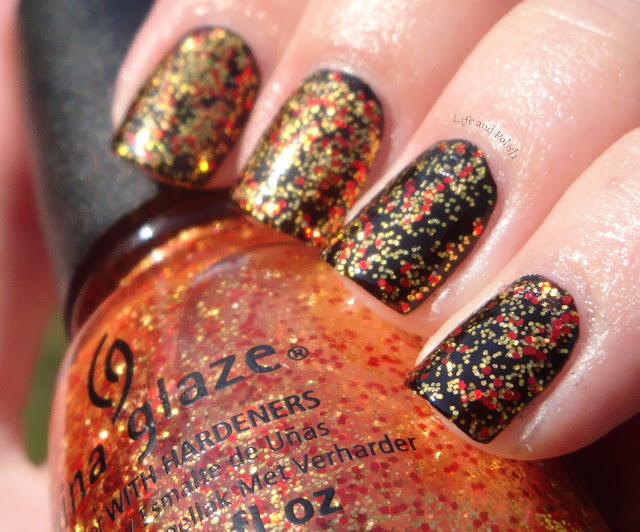 This is beautiful, gold glitter with small red hex glitter in a clear base. I decided to wear it over a coat of Cult Nails Nevermore (sidenote: Nevermore is AMAZING. 1 coater black. Seriously, you all need it!). I love this combination! Even in the shade it looks like it's glowing! I loved this combination so much, I even made a ring & some earrings to match! What do you lovelies think? 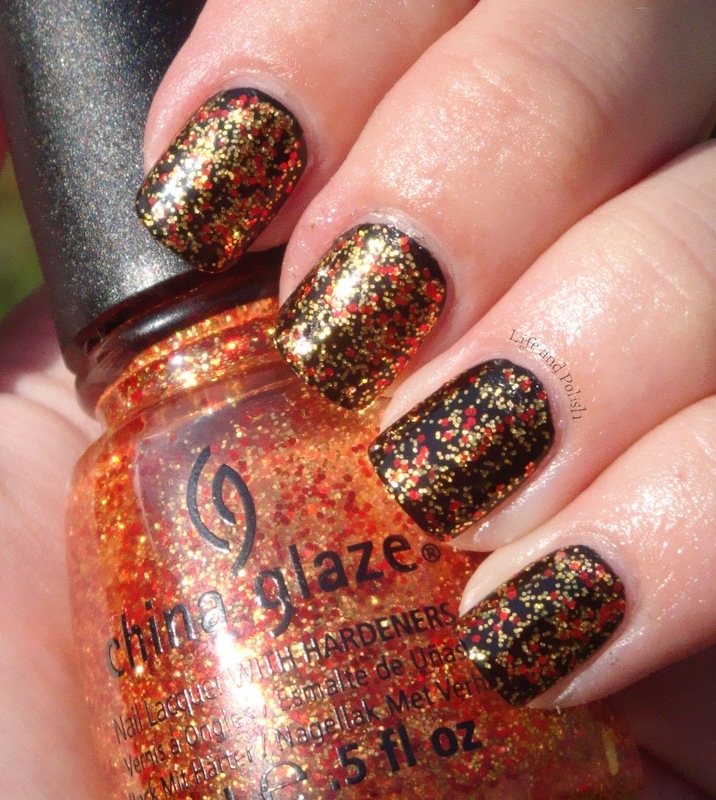 Anyone own this polish? This will definitely be my manicure when the Hunger Games: Catching Fire comes out, complete with my matching jewelry! 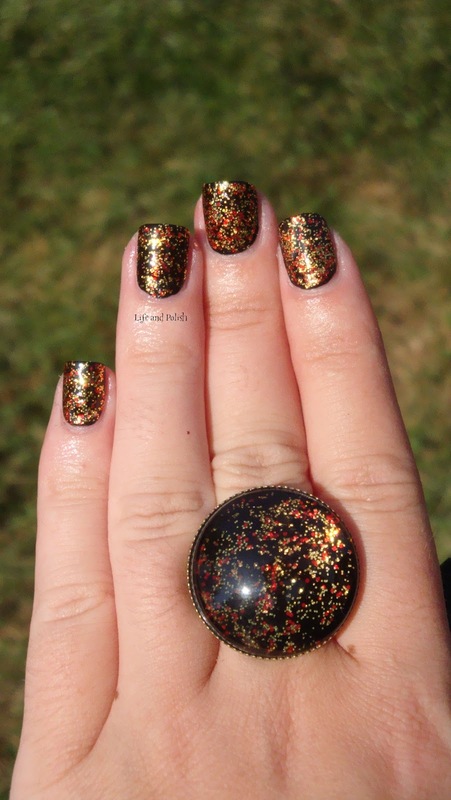 The ring looks lovely and I love the Hunger Games collection! Looking at this again makes me love it so much! The ring is gorgeous too ♥.